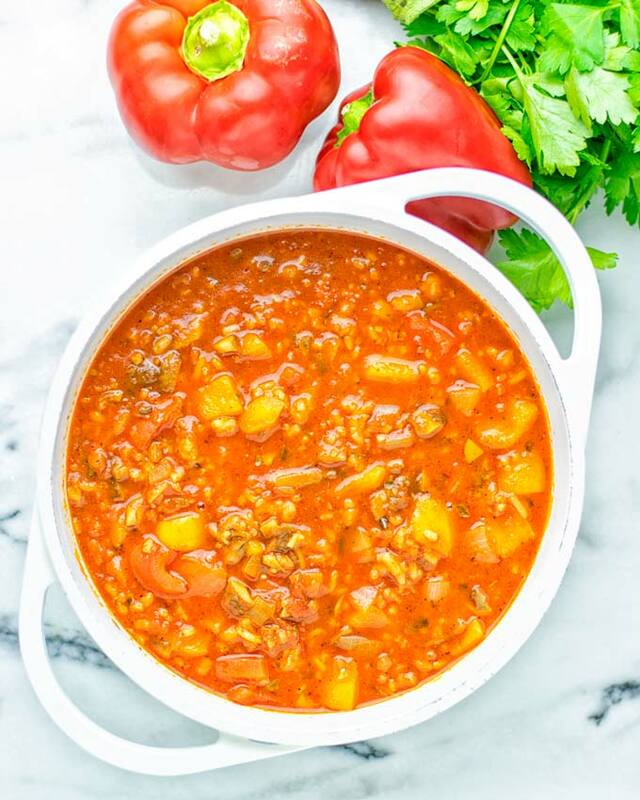 This incredibly easy Stuffed Pepper Soup comes together in one pot and is naturally vegan and gluten free. 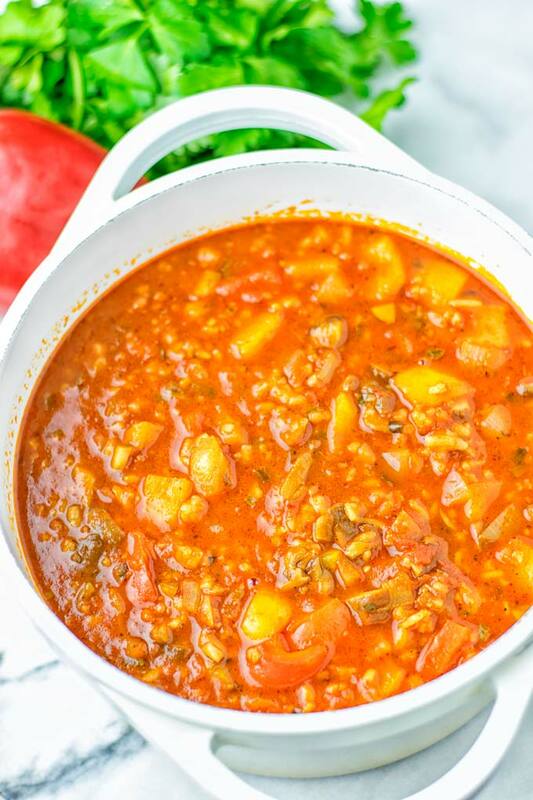 Within 15 minutes you can enjoy a healthy and comforting soup from simple basic ingredients. 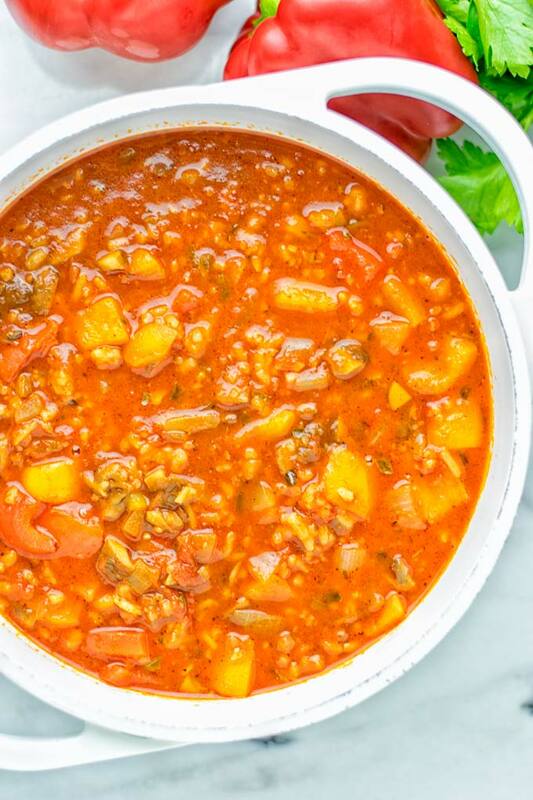 I love about this soup that it is so versatile and allows me to customize it every time with new add ons, such as extra mushrooms and onions, or spices. So little preparation for such a great family meal. 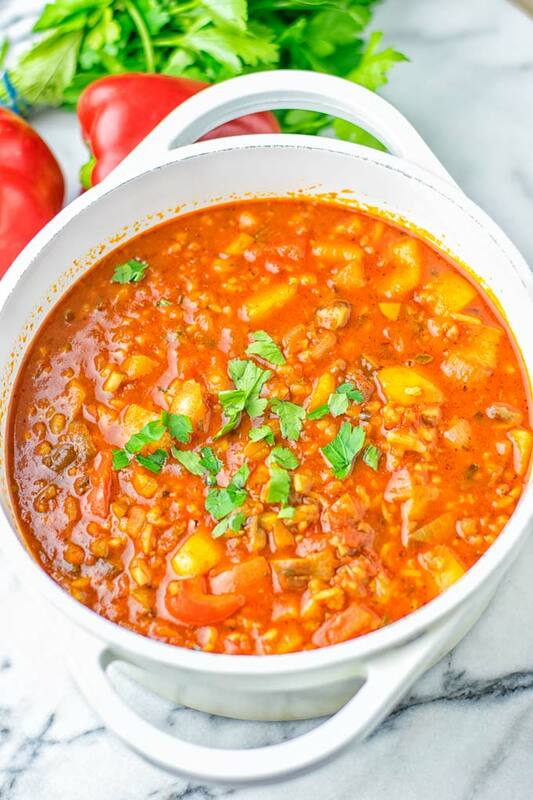 It’s hearty, super satisfying, made in one pot, packed with bold flavors, a keeper in and out which make everything so easy. Also meaty if you add the optional mushrooms and a must try for everyone who loves seriously good comfort food. If you follow me a bit you know I’m all about simple dishes that are easy to prepare, such as this One Pot Chili Mac and Cheese. This is why we do all of this in one pot. So you don’t have to cook the rice separately, it will all cook together. 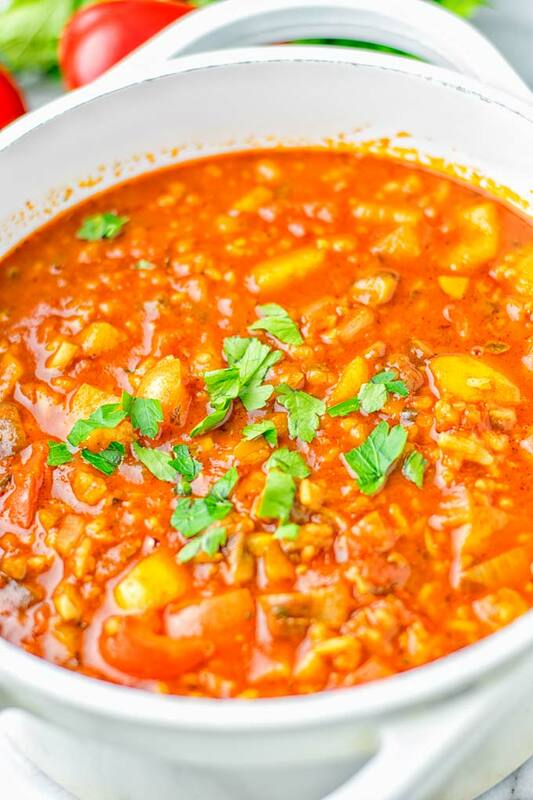 I’m pretty sure you guys all know Stuffed Pepper Soup, which is often made with ground beef, bacon, or pancetta and chicken broth. For real it’s not plant based or dairy free which is why I do something different. I used vegetable broth and for ground beef, pancetta or bacon I added optional mushrooms. Which will truly lead to a meaty, bold, and hearty texture. First heat a bit of oil or for oil free cooking just a bit of vegetable broth. Add garlic, bell pepper, optional onions, and mushroom. Fry everything for around 3 minutes, followed by rice, marinara, chopped tomatoes, vegetable broth, and water. Let it all cook for 12 minutes. Last, season with salt, pepper and add optional Italian seasoning, chili, paprika powder and maple syrup. Serve on plates or bowls. 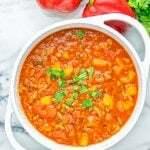 It makes such an amazing and delicious one pot meal for dinner, lunch, meal preparation, and a great work lunch option. I made it recently for some friends and even my non vegan friends got a big soft spot on it. No one ever guessed it was made with such simple ingredients. Of course I added the optional mushrooms, because these will do the trick magically for the texture and taste. You can leave them out which will be amazing as well, but the mushrooms takes it to a whole new level. As you can see I also added optional things like chili and paprika powder, Italian seasoning and maple syrup. These are totally optional, but seriously it truly makes that dish so bold and flavorful. The Maple syrup provides a sweet touch to the other spices. 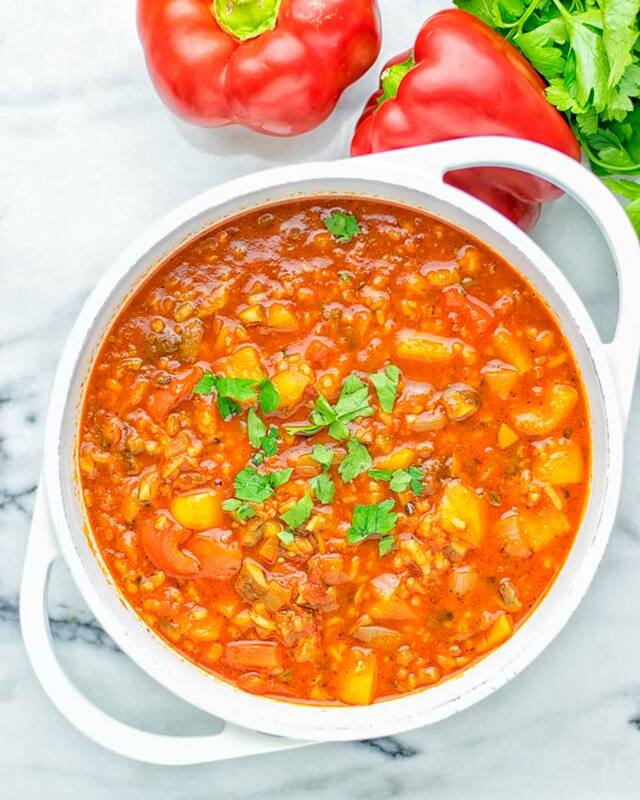 If you’re looking for freezer meals, this Stuffed Pepper Soup is perfect for you. You can make it in advance which will make things even easier. Note: you can freeze soups for around 1 month. If you keep them frozen longer they might loose some flavor and texture. Always make sure that your soup is completely cold before freezing. Hot or not properly cooled leads to loosing flavor and texture as well. Properly cooling will lead always to the best quality. For the best flavor experience keep this in mind, also make sure to use freezer bags. Finally when thawing, do it overnight in a fridge. Reheat always carefully over medium or low heat. Use thawing or defrosting setting. If you don’t have such setting, please make sure to choose a lower setting for it. This makes sure the soup will thaw smoothly which you can’t achieve with a high temperature. 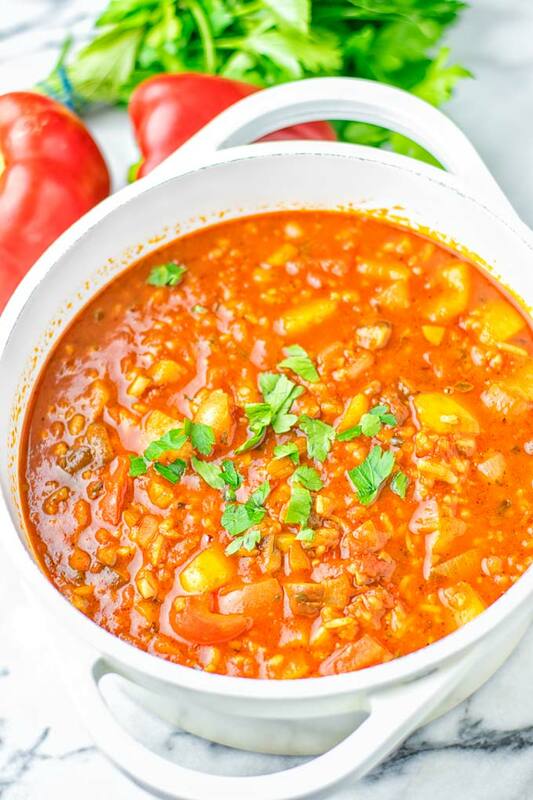 Give this Stuffed Pepper Soup a try and learn how easy and delicious it is. Tag me on Instagram or Facebook with a snapped pictures. Always love seeing your remakes, Florian. Add garlic, bell pepper, optional onions, and mushrooms. Fry everything for around 3 minutes, followed by rice, marinara, chopped tomatoes, vegetable broth, and water. Let it all cook for 12 minutes. Hi MaryLynn! Fixed! My rice was done in 8 minutes so the cooking time is accurate! But it will depend on your used rice and brand. Hope that helps! trying to get protein in my vegan meals for my athletic kids- could I add chickpeas to this in place of rice or do you suggest something else? Hi Lynne! Try chickpeas or lentils!